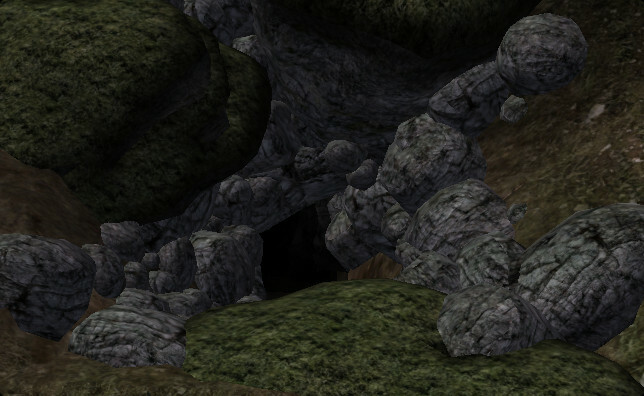 An inhabited cavern in the Lorchwuir Heath. Features two nearby entrances. Purpose still unknown. I would like to claim this please. I've been working on a cave that should fit this exterior. What do you think about making it an abandoned mine? My idea is that the beginning of the mine is still mostly intact, but farther in the infrastructure gets more and more damaged. Possibly rock falls and the general instability of the area dissuaded further mining in the deeper areas, and the beginning area ran out of ore. Also, the bridge to the deeper areas was badly damaged by a rock fall, and it wasn't worth repairing, since it was liable to break again in the near future. That sounds very fitting. Grant! Not finished yet, but it's coming along. I still need to add some more rocks in the tunnels and caverns, and start adding furniture and clutter, as well as set up the light sources. Also, I've split the claim into two cells to keep fps high and allow the player to always be able to sleep in the first area. This is an active silver mine, and the first area will have miners in it. 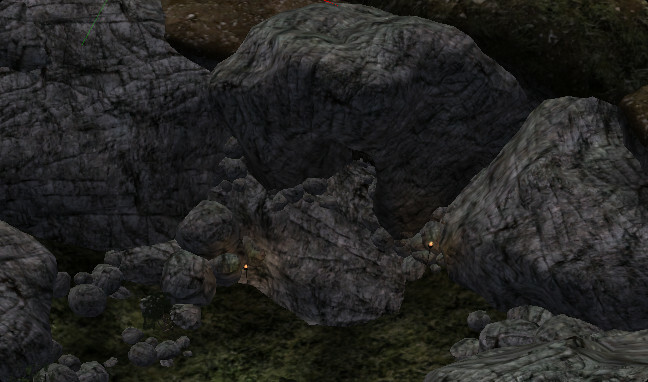 When the village above the mine was destroyed, the invaders(either Nords or Redguards) didn't damage the mine so they could make use of it themselves. So if it was a Hammerfell village, the miners are Nords/Skyrim citizens, and if the village was controlled by Skyrim before it was destroyed, the miners should be Redguards. The second area of the mine is severely damaged by rockfalls, and is very unstable. The miners refuse to work in the area despite the large amount of silver ore in that section. Even if they would work there, the bridge is broken and cave-ins block the path. Rats and other vermin have taken up residence there in the miners' absence. The cave-ins are natural and unrelated to the war. Finished and ready for review! Tamriel Data vs 4. Last edited by Iskuss1418 on Wed Jan 31, 2018 2:04 am, edited 1 time in total. In case you want it dependent on the new data update. miner's pick - I properly rotated a bunch of these. A few were good though. miner's pick - I properly rotated these. Playtested as well, everything looks fine going through the interior. Looks like there were two entrances to this interior, but only one is present in Iskuss's file. So, another cave may need to be made. Last edited by MinerMan60101 on Tue Apr 10, 2018 12:21 am, edited 1 time in total. This is ready for merging, but keep my last comment in mind and either make a new claim or cover up the other entrance with a rock. I think one cave is enough here, then. Let's just delete the other entrance. Edit: Iskuss has volunteered to make a small cave for the other entrance. Let's just keep it in this thread, now that the other int has been reviewed. The T_IngFood_CheeseWheelNord_01 and T_IngFood_CheeseWheelNord_02 references will have to be replaced with the equivalent cheesewheel containers when they're added to PT Data Addon. Second Cave finished and ready to be reviewed then merged. It's unrelated to the first int on this page, but is in the same cell: "-101, 0"
Find the Mournhold style camp, then go northwest to the burned village. Find the mine next to the village, then go in the direction the door of the mine is facing to find the cave. Or just double click the black screen entrance in the reference window to find it straight away. You'll need the newest sky_main I just posted. - Except that in OpenMW the physics goes through the roof and FPS goes down the drain because all of the bones have collision, so they need either simplified or no collision. Mine and village were Redguard. Lower part of mine was abandoned due to instability and broken infrastructure. Nords invaded and took over mine. Current Nord miners stick to upper mine. Let's make the boss miner a merchant who buys ore. Player can explore in lower mine to find ore to sell to merchant miner. Merged Sky_iRe_Lorcw01_02 which is the Wormouth Den into Sky_Main. Added Pathgrids for creatures in lower level. Closed. I've merged all ints on this page into Sky_Main. Would someone mind moving this to Completed please?